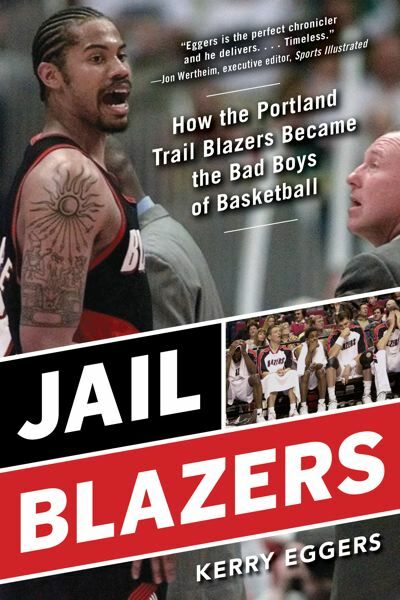 Editor's note: The Portland Tribune will have four issues with excerpts from Kerry Eggers' new book, "Jail Blazers: How the Portland Trail Blazers became the Bad Boys of Basketball." Eggers' book chronicles the period of Trail Blazers basketball from about 1994-2006, with insights from more than 70 players, coaches, executives, broadcasters, sportswriters and others close to the scene during those years. The following is a selection of quotes, comments and observations that give the reader an idea of the content in the book, which is available at a number of Portland bookstores, including Annie Bloom's and Broadway Books along with assorted Powell's and Barnes & Nobles outlets. The book also can be ordered through Amazon. • Coach P.J. Carlesimo and point guard Rod Strickland had an acrimonious relationship during their two seasons together from 1994-96. Today, Strickland has mellowed in his assessment of his former coach. "Now that I've been away from this for some years, I have a better handle on how it was then," Strickland said. "When P.J. and I see each other now, we're great. If me and P.J. would have been able to talk then, if both of us could have gotten outside our BS, we could have gotten something done. "P.J. may have come in thinking he had to deal with me in a certain way ... we could have sat down and figured it out. We never did. I took a lot of things personally. He came in as a college coach. They're so used to dealing with players in a certain way in college. Pros don't want to hear that. He couldn't separate that. I was a guy who, if I thought you were BS, there's no coming back. "I'm one of those people, I can hold a grudge. I remember how people treat you. P.J. came in with his rah-rah college BS, screaming and cussing. But it's water under the bridge. I'm glad we're good now." • Isaiah "J.R." Rider was a talented but troubled shooting guard through three seasons (1996-99). Rider had some low moments in the deportment category, but perhaps none worse than a day in February 1998 when he was feeling underappreciated by Blazer fans. "I'm fed up right now. I want to go home, take a bath and get my thoughts together. Can I take it like I've been doing for three or four years? Yeah, but it takes a toll." Wrote Dwight Jaynes the following day: "He spun a mystical tale of being followed in strange automobiles, of high-speed car chases ("Is it a crazy fan? A media person? A racist sniper? It could have been a cop. Could have been an FBI man") and of the wife of a Blazer staffer giving him dirty looks before the game. He spoke about how unfairly he was being treated by fans: "They don't boo (Arvydas) Sabonis when he misses shots. They don't boo Kenny Anderson or Rasheed Wallace." Though Anderson and Wallace, both black, were excluded from the fans' scorn, Rider opined that there "definitely" was racism in the Portland area, "just like Minnesota or certain areas of any city that are not integrated and is like this ... come on. We can go 40 miles down the road and they're probably still hanging people from trees." General manager Bob Whitsitt gave Rider a one-game suspension after his remarks. • Arvydas Sabonis was an important part of the Jail Blazer crew, playing seven seasons from 1995-2003. 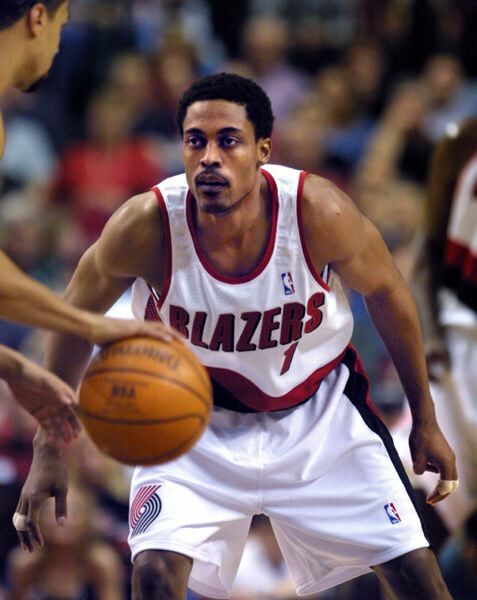 The 7-3 Lithuanian lug was a character and a popular teammate, to which ex-Blazer forward Brian Grant attests. "People don't know how funny Sabonis was," Grant says. "He had his act down pat. 'I don't know English that well.' I started talking to him, and he started talking to me like, 'That guy is an a—hole. And I'm thinking, 'So the guy does know some English. "Once we were on a trip to New Jersey and he goes, 'You go to dinner with me tonight.' I went out with him. Applebee's or something. Sarunas Marciulonis was there, too. We're going to drink. He (Sabonis) pulls the vodka out and sets up shots. He slaps me across the face. I say, 'What's wrong with you?' He says, 'Always look me in the eye (during a toast) — always.' I started laughing. It was quite a night. All I remember is his buddies carrying me out of there." • Hall of Fame broadcaster Bob Costas was the play-by-play man for the Blazers' infamous Game 7 of the Western Conference finals matchup with the Los Angeles Lakers in 2000. Costas discussed Portland's "Jail Blazers" sobriquet during those years and whether or not people across the country felt it was deserving. "The national image was more forgiving than the nickname, in part because guys like Scottie Pippen and Arvydas Sabonis and Brian Grant gave them a bit of a good citizen's image," Costas says. "Pippen brought his cred from Chicago. Sabonis was an admirable talent who held his own against Shaq (Shaquille O'Neal) as well as anybody. Mike Dunleavy was a respected coach. To a national audience, they were among the faces of the franchise. "Rasheed (Wallace) was a terrific player who was notorious. He had a chip on his shoulder that stretched from Portland to Los Angeles, from the Rose Garden to Staples Center. The whole league and the whole world were against him, and he set records for technical fouls, which obscured what a good player he was. Bonzi Wells and J.R. Rider and guys like that were alternately an asset and a detriment. But from a national perspective, I don't think they were as much the face of the team." • Shawn Kemp spent only two seasons (2000-02) with the Trail Blazers, the former All-Star forward on a descent as he struggled with weight problems and drug abuse. The problems peaked in April 2001 when Kemp entered the NBA's anti-drug program. There were indications that Kemp was having serious drug issues. He often would ride in the back of Paul Allen's private jet, where there was a single captain's seat in a private room. "You could hear snorting sounds back there at times," said one player, who asked to remain unidentified. Another player, who also chose to be anonymous, said Kemp was going through pre-practice stretches and drills when he ran to the bathroom. When he returned, the teammate noticed a white mustache line under Kemp's nose. While doing team laundry, an equipment manager found little packets of cocaine in Kemp's dirty socks. Then, on a game day, Gary Grant came to team officials with a Crown Royal bag full of coke that he had found in a toilet paper dispenser in the players' locker room at the Rose Garden. A players-only meeting was called the next day. When teammates confronted Kemp, he denied it at first, saying, "I might smoke a little weed, but I'm not doing any cocaine." After evidence was gathered on Kemp, NBA security met with him. Under the league's anti-drug program, he would not be fined or suspended if he went to a rehab program immediately. Kemp then turned himself in. • Forward Ruben Patterson, who played five years with the Blazers (2001-06), had a nasty fight during an April 2003 practice session with teammate Zach Randolph, which resulted in Patterson suffering a fractured orbital bone when Randolph sucker-punched him. After the season, Patterson had requested a trade with the team's new basketball executives, President Steve Patterson and General Manager John Nash. When he arrived at training camp for the 2003-04 campaign still on the Portland roster, Ruben wasn't happy. "I am very disappointed," he said. "I have not talked to the guys running the club now. I don't even know what Steve Patterson looks like. It upsets me. It's frustrating. They have known how I have felt (about Randolph) the whole summer. Deep down in your heart, you want to kill the guy. "I'm not going to beat him up, or have somebody beat him up. I am going to go in with a positive attitude. Yeah, it's messed up, but I have to do my job. I have to think about my family and my future and my contract. I have to go in and do my job and help my team." Randolph had apologized to Patterson in a meeting with team officials, "but it was a fake apology," Ruben said. "I know he didn't mean it." "My whole thing is, (Randolph) can talk to me on the basketball court. Off the court, I want no part of him. No friends, nothing. I hate to have that type of attitude, but we can't be buddies, we can't be anything but teammates. You can be cool with me on the court, but off the court, you can't be around me." • Former referee Joey Crawford worked 39 years in the NBA until his retirement in 2016. Crawford weighed in on the post-game incident between referee Tim Donaghy and Portland forward Rasheed Wallace in 2003, which led to a seven-game suspension for Wallace. Donaghy would later serve a 15-month prison term for betting on games in which he officiated. "I wish Rasheed would have beaten him up," Crawford says. "It wasn't the fact he disrespected my profession. I'm talking about Donaghy being what he was. It may not make sense to your readers, but it makes sense to all of us (referees). What Donaghy did was against everything a ref ever stood for. I wish Rasheed would have beat the hell out of him."